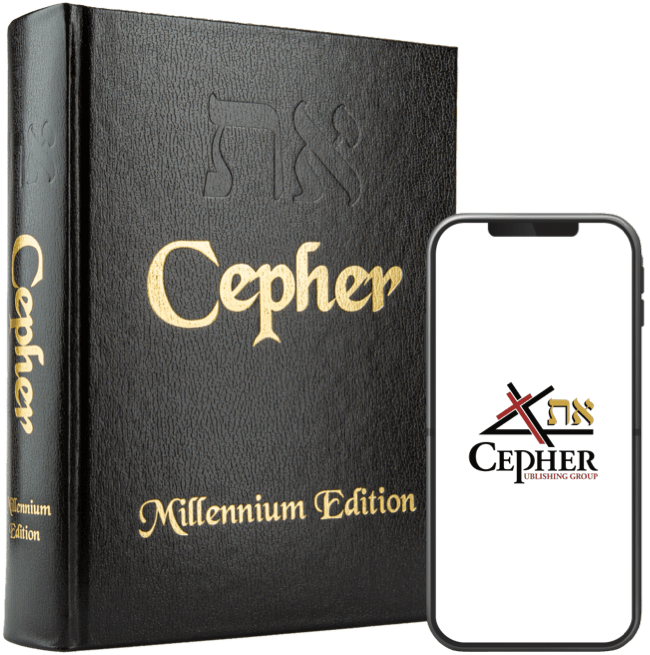 In the Eth CEPHER, we have set forth the sacred name in an English transliteration intended to impart the name to those who do not speak Ivriyt (Hebrew). The Ivriyt reader can readily discern the name while reading scripture, but the English speaker has been given LORD, Lord, or lord throughout the text in replacement of that which is actually there. This is the number of the Kasb’el; the principal part of the oath which EL ELYON, dwelling in glory, revealed to the holy ones. 20 Its name is Beka. He spoke to holy Miyka’el to discover to them the sacred name, that they might understand that secret name, and thus remember the oath; and that those who pointed out every secret thing to the children of men might tremble at that name and oath. 21 This is the power of that oath; for powerful it is, and strong. 22 And he established this oath of Akae by the instrumentality of the holy Miyka’el. 23 These are the secrets of this oath, and by it were they confirmed. 24 Heaven was suspended by it before the world was made, forever. 25 By it has the earth been founded upon the flood; while from the concealed parts of the hills the agitated waters proceed forth from the creation to the end of the world. 26 By this oath the sea has been formed, and the foundation of it. 27 During the period of its fury he established the sand against it, which continues unchanged forever; and by this oath the abyss has been made strong; nor is it removable from its station forever and ever. 28 By this oath the sun and moon complete their progress, never swerving from the command to them forever and ever. 29 By this oath the stars complete their progress; 30 And when their names are called, they return an answer, forever and ever. 31 Thus the heavens have the blowing of the winds: all of them have ruachoth, and are a complete combination of breathings. 32 There the treasures of thunder are kept, and the splendour of the lightning. 33 There are kept the treasures of hail and of frost, the treasures of snow, the treasures of rain and of dew. 34 All these confess and laud before YAHUAH TSEVA’OTH. 35 They glorify with all their power of praise; and he sustains them in all thanksgiving; while they laud, glorify, and exalt the name of YAHUAH TSEVA’OTH forever and ever. 36 And with them he establishes this oath, by which they and their paths are preserved; nor does their progress perish. 37 Great was their joy. 38 They blessed, glorified, and exalted, because the name of the Son of Adam was revealed to them. 39 He sat upon the throne of his glory; and the principal part of the judgment was assigned to him, the Son of Adam. Sinners shall disappear and perish from the face of the earth, while those who seduced them shall be bound with chains forever. 40 According to their ranks of corruption shall they be imprisoned, and all their works shall disappear from the face of the earth; nor thenceforward shall there be any to corrupt; for the Son of Adam has been seen, sitting on the throne of his glory. 41 Everything wicked shall disappear, and depart from before his face; and the Word of the Son of Adam shall become powerful in the presence of YAHUAH TSEVA’OTH. 42 This is the third parable of Chanok. Thus the heavens have the blowing of the winds (ruachoth): all of them have ruachoth, and are a complete combination of breathings (ruachoth). Everything wicked shall disappear, and depart from before his face; and the Word of the Son of Adam shall become powerful in the presence of YAHUAH TSEVA’OTH. Thus says YAHUAH the King of Yashar’el, and his Redeemer YAHUAH TSEVA’OTH; I am the first, and I am the last; and beside me there is no ELOHIYM. As for our Redeemer, YAHUAH TSEVA’OTH is his name, the Holy One of Yashar’el. It is under this name that the judgments found in Yirmeyahu (Jeremiah) are done. However, as Chanok testified, and as Yesha`yahu testified, so Yirmeyahu testifies to tell us that YAHUAH TSEVA’OTH is his name. Let us consider however, another name, the name YAH (יה). This name stands alone as YAH 45 times in the Tanakh, Ex 15:2; Ex 17:16; Ps 68:4; Ps 68:18; Ps 77:11; Ps 89:8; Ps 94:7; Ps 94:12; Ps 102:18; Ps 104:35; Ps 105:45; Ps 106:1; Ps 106:48; Ps 111:1; Ps 112:1; Ps 113:1; Ps 113:9; Ps 115:17; Ps 115:18; Ps 116:19; Ps 117:2; Ps 118:5; Ps 118:14; Ps 118:17; Ps 118:18; Ps 118:19; Ps 122:4; Ps 130:3; Ps 135:1; Ps 135:3; Ps 135:4; Ps 135:21; Ps 146:1; Ps 146:10; Ps 147:1; Ps 147:20; Ps 148:1; Ps 148:14; Ps 149:1; Ps 149:9; Ps 150:1; Ps 150:6; Isa 12:2; Isa 26:4; Isa 38:11. As I have discussed before, this name YAH is the central aspect of the name given to Mosheh on the mountain. And ELOHIYM said unto El-Mosheh, EHAYAH ASHER EHAYAH: and he said: Thus shall you say to the children of Yashar’el, EHAYAH has sent me unto you. However, before this name appears, we see the existence of the Tetragrammaton (יהוה), which appears 5,521 times in the Tanakh alone. In the Eth CEPHER, we set this forth as YAHUAH. In this configuration, we see the name YAH at the outset, meaning I AM. YAHUAH on the other hand means I AM he who breathes life. But that which carries the name YAH is that which is called by his name. O YAHUAH, though our iniquities testify against us, do it for your name's sake: for our backslidings are many; we have sinned against you. 8 O the Hope of Yashar’el, the Saviour thereof in time of trouble, why should you be as a stranger in the land, and as a wayfaring man who turns aside to tarry for a night? 9 Why should you be as a man astonished, as a mighty man who cannot save? Yet you, O YAHUAH, are in the midst of us, and we are called by your name; leave us not. And YAHUAH spoke unto Mosheh, saying: 23 Speak to El-Aharon and to his sons, saying: In this way you shall bless את eth-the children of Yashar’el, saying unto them: 24 YAHUAH bless you, and guard you: 25 YAHUAH make his face shine upon you, and be gracious unto you: 26 YAHUAH lift up his countenance upon you, and give you peace. 27 And they shall put את eth-my name upon the children of Yashar’el; and I will bless them. If my people, which are called by my name, shall humble themselves, and pray, and seek my face, and turn from their wicked ways; then will I hear from heaven, and will forgive their sin, and will heal את eth-their land. Humble yourselves, my people, which are called by my name; pray, and seek my face, and turn from the path of evils; and I will hear from heaven, and will forgive sins, and will heal את eth-their land. And who are these people who are called by the name of YAH?